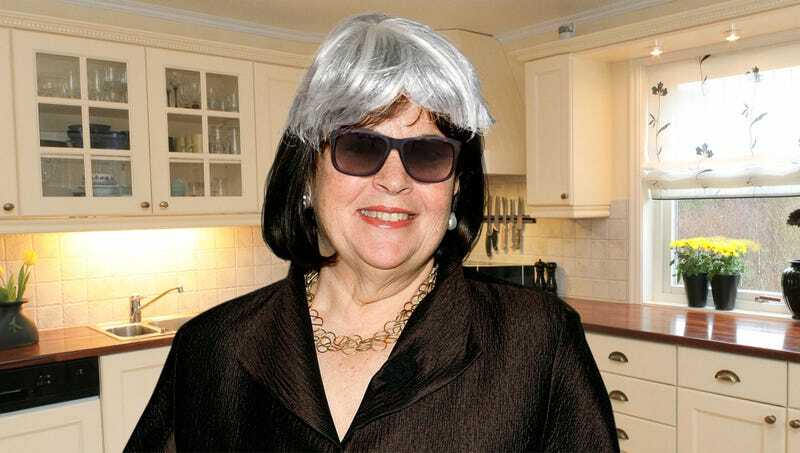 Barefoot Contessa host Ina Garten loves sharing the delicious meals she makes with her husband, Jeffrey, at the end of each episode, but unfortunately, Jeffrey doesn’t always make it back from work in time. Here are four episodes of Barefoot Contessa where Jeffrey got stuck in traffic on his way home so Ina Garten pretended to be him and ate his dinner. On this season 13 episode, Ina had just put the finishing touches on a rotisserie chicken with satay dip when she received a call from Jeffrey explaining that due to some traffic, he wouldn’t make it back to the Hamptons for a few more hours. She immediately hung up the phone, looked directly into the camera, and said, “Ding dong. Jeffrey’s home!” before heading offscreen, only to return a minute later wearing a short gray wig, sunglasses, and an oversized black peacoat. “It’s me, Jeffrey! Wearing my Jeffrey coat!” Ina announced, before taking her husband’s seat at the table and scarfing down curried chicken salad while saying, “I love my wife, Ina, who did all this chicken just for me.” After eating all the food, Ina shouted, “Yum yum, dinner!” and claimed that this was Jeffrey’s famous catchphrase before the episode cut to some B-roll of a farmers market with soft mambo music playing over it. Ina had just finished making fettuccine with white truffle butter and mushrooms when she pretended to be Jeffrey once again. Opting for a new Jeffrey costume that she felt was more convincing, she arrived back on the patio with tin foil wrapped around her head and several dishtowels draped over her body and said, “Work at Yale was amazing but it doesn’t come close to my wife’s pasta!” However, the highways weren’t as bad as Ina expected, so just as she declared that the ginger shortbread cookies passed something she just made up called “Jeffrey’s Famous Dessert Test,” the actual Jeffrey walked out to the garden. In a panicked attempt to maintain her charade, Ina proceeded to point at Jeffrey and yell, “Ah, there’s my lovely wife, Ina! I’m Jeffrey who works at Yale but eats right in this chair! Yum yum, dinner!” Jeffrey quietly took in the scene for a moment, then walked back into the house. Unfortunately, Ina forgot to take off the costume during the closing “Ask Ina” segment, so when a viewer asked, “Can you substitute mozzarella for burrata?” she answered, “Why would you ask me, Jeffrey, dean emeritus of the Yale School of Management, that question? You know who you should ask? Ina, my wife. Yum yum, dinner!” When another viewer asked, “Well, where’s Ina, then?” Ina replied, “Gone,” and refused to elaborate. While it was definitely poor timing that Jeffrey got stuck in traffic during his birthday celebration in the season 22 opener, Ina clearly had a plan B to manage the situation. When the show cut from the cooking segment to the meal, Ina was wearing a mask she’d made from a photo of Jeffrey with the eyes poked out, eating Jeffrey’s birthday sautéed chard across from a head of cauliflower with a face drawn on it in hollandaise sauce that was attached to a broom. “What a delightful meal you made for me, Ina!” exclaimed Ina as she stroked the side of the cauliflower broom, “You have made me the happiest Jeffrey in the world. I’m 100 years old.” She then pressed play on a boombox and began tenderly slow-dancing to Taylor Swift’s “Welcome To New York” with the cauliflower broom as she tearfully declared, “Ina, you look just as beautiful as you did the night we met 100 years ago,” before sneaking in a final “Yum yum, dinner!” chant as the credits started to roll.